Comic Crazy! – From SpongePedia, the biggest SpongeBob-wiki in the world! Preceded by: SpongeBob SquarePants: The Great Escape! Comic Crazy! is a SpongeBob SquarePants book that was released on the 9th of June 2009. The eleven comics in it are first printed in Nick Magazine. There is a sequel for Comic Crazy! 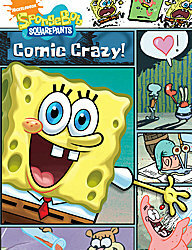 called SpongeBob: Comic Crazy...Take 2!. It has some more comic collections from Nick Magazine. In one comic, there is Smallfins McKwolaski. This page was last modified on 10 August 2012, at 10:03.